As you make your seed selections for next year, a great resource for side-by-side comparisons of yields, lodging and seed quality data are available at the click of the mouse! Data from the University of Illinois' Department of Crop Sciences 2012 Variety Testing Program are in. The Variety Testing Program was established in 1934 and is a uniform testing program in which seed companies from the Midwestern region pay a fee to include their soybean varieties or corn hybrids in a regional performance test. For corn, there are four regions in which seed companies can place their entries (the northern, west central, east central and southern regions) and three locations within each region. 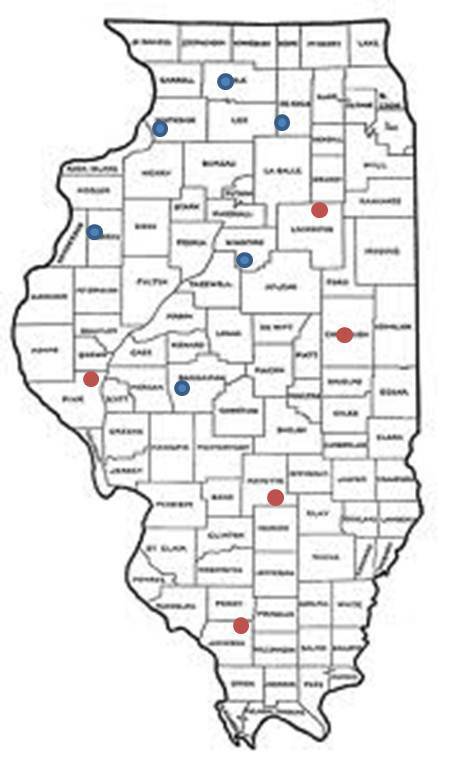 Due to drought conditions throughout most of southern and central Illinois, in 2012 data is only available for six of the 12 locations (Figure). Northern trials include locations in Mt. Morris, DeKalb and Erie; West Central trials include locations in Monmouth and New Berlin; only one location, Goodfield, collected data in the East Central region; and data is not available for the southern region. At the NWIARDC in Monmouth, hybrids were entered into at least one of two trials, corn rotated with soybean and/or corn following corn. A total of 103 traited hybrids and 14 conventional hybrids from 26 seed companies were included in the rotated corn trial. A total of 39 entries were included in the trial for at least 2 years and eight were included for 3 years. Yields ranged between 162 and 217 bu/A for the traited hybrids and between 162 and 196 bu/A for the conventional hybrid entries. Seed chemical composition was also evaluated for each hybrid; for traited hybrids protein content ranged between 3.1 and 4.6 percent, oil content between 7.5 and 9.4 percent, starch content between 71.3 and 73.0 percent and ethanol production between 2.64 and 2.77 gallons/bu; for conventional hybrids, protein content ranged between 3.8 and 4.5 percent, oil content ranged between 8.3 and 9.7 percent, starch content between 71.4 and 72.9 percent and ethanol production between 2.64 and 2.73 gallons/bu. For the corn following corn trial at Monmouth, there were a total of 37 traited entries from 12 companies. Yields ranged between 193 and 236 bu/A. Seed chemical composition was also evaluated for each hybrid; protein content ranged between 3.7 and 4.5 percent, oil content between 7.8 and 9.3 percent, starch content between 71.4 and73.2 percent and ethanol between 2.66 and 2.76 gallons/bu. In 2012, the Variety Testing Program evaluated conventional and Roundup resistant soybean varieties in five regions and a total of 13 locations in Illinois: Region 1 had trials in Erie, Mt. 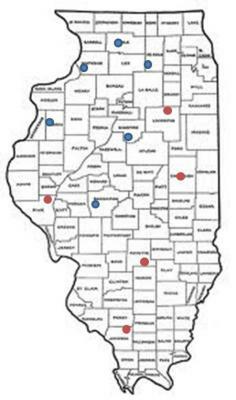 Morris and DeKalb, Region 2 had trials in Monmouth, Goodfield, and Dwight, Region 3 had trials in Perry, New Berlin and Urbana, Region 4 had trials in Belleville and St. Peter and Region 5 had trials in Elksville and Harrisburg. Despite the drought, the Variety Testing team was able to collect solid, reliable data at each location. At the NWIARDC in Monmouth, the conventional soybean variety testing trial, from maturity groups 2 and 3, had a total of 50 entries including 4 public varieties and varieties from 13 different seed companies. Yields ranged between 43.0 and 80.4 bu/A, protein contents ranged between 31.9 and 39.4 percent and oil contents ranged between 17.0 and 20.7 percent. In the Roundup resistant soybean variety trial, yields ranged between 54.3 and 84.1 bu/A, protein contents ranged between 31.3 and 36.1 percent and oil contents between 17.7 and 21.7 percent.